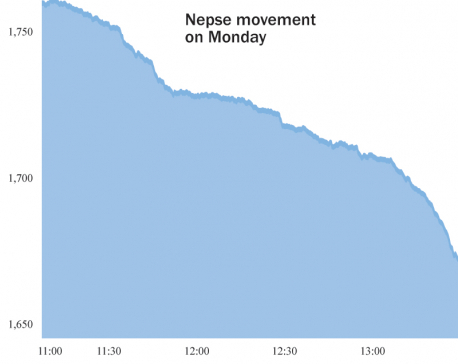 KATHMANDU, Sept 10: The Nepal Stock Exchange (Nepse) benchmark index fell marginally by 0.01 point this week to close at 1,554.55 points on Thursday, the last trading day of the week. 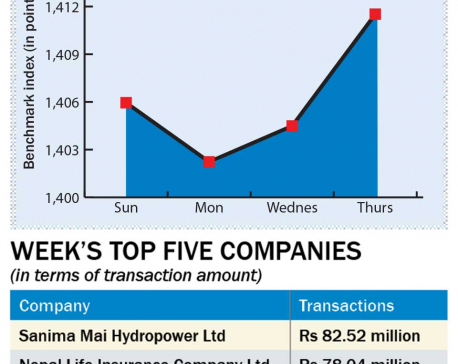 While the stock market was on a downward trend on the first trending day amid the announcement of Securities Board of Nepal (Sebon) to make personal account number (PAN) mandatory from next fiscal year, it recovered mid-week. It again took a dive in the last trading day of the week. The stock market remained closed on Sunday and Tuesday to mark public holidays. The stock market closed at 1,554.56 points on Monday -- the first trading day -- down by 25.47 points due to a 'panic' among investors due to the Sebon announcement. The stocks recovered 11.94 points the next day before falling again by 11.95 points on the last trading day. Organizing a press meet last week, Sebon had announced that it was preparing to introduce a rule for investors, making PAN compulsory for share trading from Fiscal Year 2018/19. Sebon is preparing to introduce the new provision after its plan to issue identification card for investors failed to materialize. According to officials of the capital market regulator, mandatory PAN requirement provision is aimed at maintaining database of investors. As Sebon still does not have database of investors, it is believed the new requirement will help the capital market regulator to have a database of investors. Manufacturing and processing group fell by 72.15 points this week to close at 2,574.39 points. Sub-indices of Insurance and Hydropower groups also went down 59.61 points and 20.7 points, respectively, closing at 8,658.4 points and 1,785.16 points. Finance group shed 4.25 points to finish at 782.31 points. Development Bank, however, jumped 15.19 points to end at 1,985.91 points. Hotels group also ended 10.88 points higher at 2,378.06 points. Sub-indices of 'Others' and Banking groups rose 5.2 points and 2.57 points, respectively, closing at 716.1 points and 1,339.18 points. Trading group remained unchanged at 214.11 points. A total of 4.5 million units shares of 171 companies worth Rs 2.41 billion were traded in the market this week through 25,860 transactions. The turnover was 32.24 percent lower than that of last week. Bonus shares of Kalika Microcredit Development Bank Ltd and Purnima Bikas Bank Ltd and rights shares of Sahayogi Bikas Bank Ltd were listed in the secondary market for their trading.